Origin and Habitat: North of, central part of Coahuila (Mexico, Northern America). Altitude range: Around 700 metres above sea level. Habitat and ecology: Ancistrocactus pinkavanus is found in an extreme ecological niche in the middle of one of the driest parts of the Sonoran desert. It grows in alluvial gypsophilous grassland, in clayish salty deposits (Bolson of Cuatrociénegas). 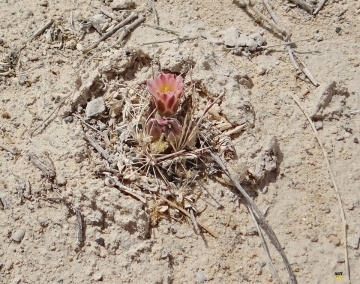 During the long extreme drought, characteristic of this area (practically throughout the year) the stems of Ancistrocactus pinkavanus retract and drive under the dried mud into small cavities so the plants comes to be completely buried, covered by a thin layer of earth and dust which protect them from the sunlight and drough. This enable them to blend well with their surroundings rendering the plants extremely cryptic or even unnoticeable from the eyes of potential predators. It is only in wet periods that these plants become visible as they swell with the liquids absorbed by the roots. When the weather is rainy, the root is able to absorb the water quickly, so the plant appears rapidly on the surface. The stem enlarges, pushing some hooked spines and the photosynthetic crown above the level of the ground and bloom some weeks after the rain. 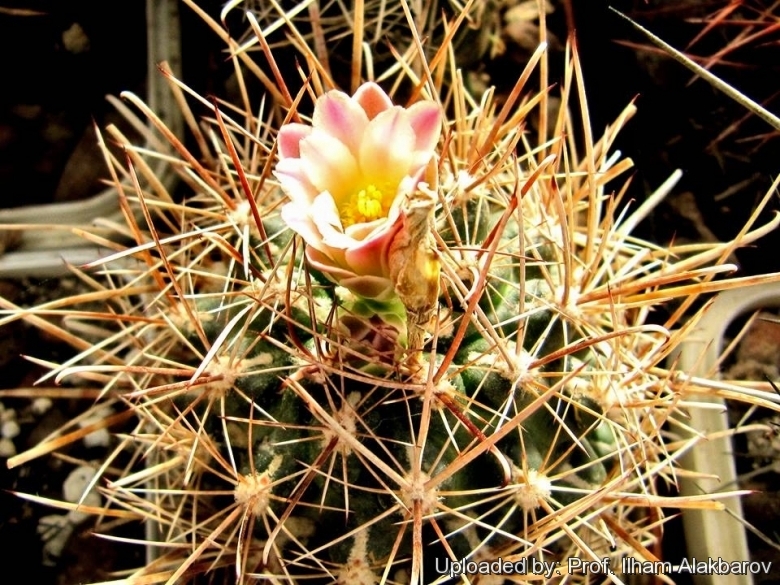 Description: Ancistrocactus pinkavanus is a small member of the genus Ancistrocactus, which produce big and beautiful flowers. It is is a quasi-geophytic plants that disappear rapidly from sight below the soil surface, dormant even for months, covered by a layer of dust and dirt and also hiding it. Once the rains arrive and the water supply is sufficient to allow a good absorption, it can swell up and appear on the surface. This is largely possible because the stem of this plant, in particular its epigeous portion, can retract for several millimetres, especially in its lower portion, near the neck. This plants is able to survive dormant for several months, hidden below the surface, thanks to its enormous tuberous root, often bi or trifurcate, which often looks disproportionate to the stem. Stems: Simple, unbranched, 1.5-8 cm tall, 1.5-7 cm wide, glaucous-green. Roots: Carrot-like, fleshy, soft 5-10 cm long and 3-6 cm wide with secondary root distally, not separated from the stem by a constriction neck. Tubercles: Arranged in ribs and spiralled in 8-11 series, conical, rounded 10-18 mm wide, 6-12 mm tall with a conspicuous woolly groove. Areoles: Oval to near circular 3-5 mm in diameter, white-woolly. Spines (juveniles spination): Young plants have only (6-)8-10(-11), 5-15 mm long radial spines per areole, white with reddish-brown tips. They are quite similar to other cacti, so they can be confused with other Cactaceae, such as juvenile forms of Mammillaria heyderi Muel., or Coryphanthas. Spines (adult spination): Mature specimens develops 4 central spines pink and rigid, not flattened, the lower one occasionally hooked. White to brownish-red, spreading 20-35 mm long. 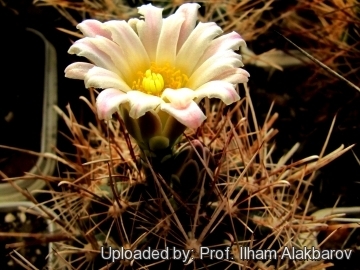 Flower: Its size is unusual for the genus Ancistrocactus, since it can exceed 4 cm in diameter and is able to emerge and open above the spines, thanks to a long pericarpel, adorned with few, big scales. The flowers emerges from the areolar groove. They are funnel-shaped to campanulate, 35-45 mm long, 25-40 mm wide pink, to magenta, The petals are large, silky, over 3 cm long and white with a purplish midstripe. A young plant, 2 cm in diameter, can develop a flower wider than 3 cm. Occasionally some specimens may bloom when they are still showing a juvenile spination, with no central spines. Fruit: The fruit is large, sometimes 3 cm in length, green or reddish and contains large helmet-like seeds, 1.5-2 mm long, contained in a mucilaginous pulp. Scales greenish-white moon-shaped and papery. Taxonomy: The characteristics of this plant are peculiar, even if we compare it with the form ‘megarhizus’ of Ancistrocactus scheeri Britton& Rose, a plant typical of areas at low altitude, which also develops a big, tuberous root. The ecology of the Ancistrocactus pinkavanus is an important distinctive character from the rest of the species. The ‘megarhizus’ plant grows primarily in flat and gravelly areas, not on clayish alluvial plains, with strong accumulation of salts and having a quite distinct ecology from the plant from Cuatrociénegas. A clarification about the relationship between Ancistrocactus brevihamatus and Ancistrocactus scheeri, presently considered as a distinct species. They are very similar in morphology and ecology except for a few characteristics, and some intermediate forms grow in the Mexican states of Coahuila and Nuevo León, with progressive intergradations, and consequently some in situ data could lead us to consider them as a single species.